No sooner had Chris Stewart set eyes on El Valero than he handed over a check. Now all he had to do was explain to Ana, his wife that they were the proud owners of an isolated sheep farm in the Alpujarra Mountains in Southern Spain. That was the easy part. Lush with olive, lemon, and almond groves, the farm lacks a few essentials--running water, electricity, an access road. And then there's the problem of rapacious Pedro Romero, the previous owner who refuses to leave. A perpetual optimist, whose skill as a sheepshearer provides an ideal entrée into his new community, Stewart also possesses an unflappable spirit that, we soon learn, nothing can diminish. Wholly enchanted by the rugged terrain of the hillside and the people they meet along the way--among them farmers, including the ever-resourceful Domingo, other expatriates and artists--Chris and Ana Stewart build an enviable life, complete with a child and dogs, in a country far from home. Edition Statement Vintage Departures ed. 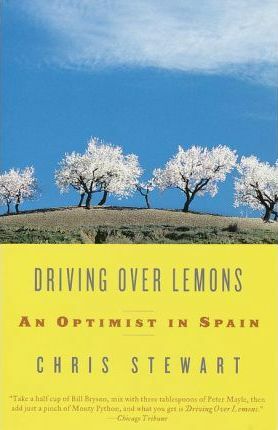 Driving Over Lemons" is the contagiously entertaining account of one couple's beginning a new life as they turn a rundown peasant farm in southern Spain into a home. Chris Stewart lives in Spain with his wife, Ana, and daughter, Chloë. From the Hardcover edition.